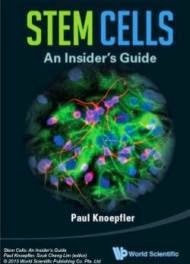 For a long time now, researchers and patients have hoped that embryonic stem cells (ESCs) -- capable of turning into any cell type of the body -- could provide insight into numerous diseases perhaps even be used to treat them. Yet progress has been hampered by the inability to transfer research and tools from mouse ESC studies to their human counterparts, in part because human ESCs are "primed" and slightly less plastic than the mouse cells. Naïve mouse ESCs are well-studied, and scientists have a strong understanding of how they function and mature into more specialized cells. But this understanding is of limited use in human ESC research, as the human cells look different, grow differently, and rely on different genes than mouse ESCs. According to Theunissen, the disparities between mouse and human ESCs are attributable not to species-specific differences but rather to differences of cell state. 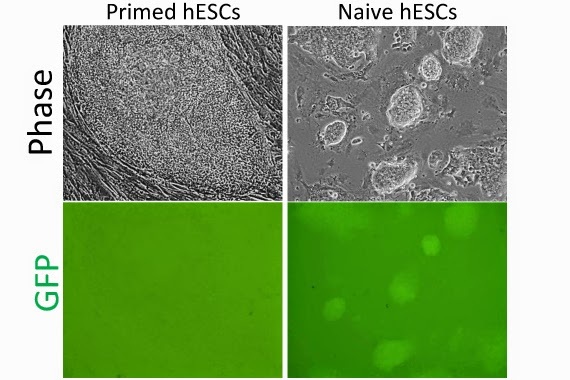 Phase and fluorescence images of conventional (primed) human embryonic stem cells (ESCs) and naïve human ESCs generated in the presence of 5 small molecule inhibitors. The naïve human ESCs exhibit activation of a fluorescent reporter linked to an enhancer of the OCT4 gene that is specifically used in the naïve state. 40X magnification. "This is important because if this cocktail only works in existing lines of human ESCs, you might wonder, does this really capture a distinct state or is this artificial? Since the cocktail works directly on human blastocysts, I think it suggests that we're really capturing a cell state that is already present in the early human embryo." said Theunissen. "We have discovered a new pathway to generate something we believe is a totally different state of pluripotency in human ESCs that is very close to the mouse naïve state. These cells may be essential for ESC technology, and that is an area we're looking forward to investigating. Now the big question for us is, does this state exist in vivo in embryos? Right now, we don't know, and that is a very interesting line of research." said Jaenisch, who is also a professor of biology at MIT. The research was supported by the Simons Foundation (SFLIFE #286977), the National Institutes of Health (NIH; grant RO1-CA084198), a Sir Henry Wellcome Postdoctoral Fellowship, a Boehringer Ingelheim Fonds PhD Fellowship, and a Jerome and Florence Brill Graduate Student Fellowship. Jaenisch is co-founder of Fate Therapeutics and an adviser to Stemgent.